Forum Index > Off-topic Talk > 12th - 13th Century Swords & Hospitallers? Posted: Sun 04 Nov, 2012 6:28 am Post subject: 12th - 13th Century Swords & Hospitallers? I'm not an expert in any sense of the word when it comes to what century would have what swords and what sort of armor. I'm trying to find a good 12th to 13th century sword that would go with my Hospitaller outfit. Any suggestions or recommendations would be great. I'm currently looking at the Hanwei Tinker Norman Sword, would that be fine? Would it be more accurate if I had an axe rather than a sword? Swords were more for the wealthy, right? So, they wouldn't be as common. I have the Kingdom of Heaven Hospitaller Robe. Is that an accurate robe? Or should I get the GDFB Hospitaller Surcoat? For a helmet and armor, what would you recommend? Was maille and a gambeson the only armour of the time period? Were there others? My favorite era! indeed I was dressed up as a Hospitaler the other evening for Halloween. For swords you are looking for a single hand sword which would have a grip ranging from 3.5" (earlier in that era) to 4.5" (toward the end of that era). The most common cross type would be a fairly long straight bar with square cross section, tapered or not (i.e., Oakeshott type 1), but a simple curved cross is also OK. The most common pommel types for that era would be Brazil nut or a simple disk form, but there are many more esoteric types. If you see yourself as fighting from horseback, then you likely want a longish blade 33-35" for reach. The blade types spanning this era are Oakeshott Xa,Xi, and XII, with some early forms of XIII. The fuller tends to be more narrow than earlier types and is getting shorter through this period from nearly the full length of the blade to 3/4 length. I think the Norman sword, although a nice little piece, is likely on the early side for the period you gave (going by the type X blade and early B pommel it looks 11th century to me) and too short for cavalry use. If you don't care about sharpness Del Tin has some pretty good options in your price range and period. Several of them capture the austere, busness-like look of knightly sowrds of that period. Otherwise the Valiant Castile might be a good option and it comes a nice scabbard. The helmet would likely be a round or conical cap (i.e., Norman type) with a nasal piece, preferably with mail attached beneath, or later perhaps a transitional great helm. I think Kingdom of heaven rendered this pretty well. For a shield, I think we are still talking kite shield, at least earlier in that period. I'm not sure if there are any exact renderings of Hospitaler uniforms from that early, just descriptions. I recall that in Nicole's book on Hospitalers he mentions switching to a standard brown at some point and some evolution in the form of the cross toward the Maltese style at some point, but later I think. Someone else will know better than I. The windlass version is the one with bits of mail hanging out? I have the GDFB tunic and cloak, they were inexpensive and look nice enough. For armour I would prefer mail with full sleeves and passing the knee. I don't think full gauntlets were used that early, so some authentic looking gloves and boots would finish it off. Maby mail gloves and leggings if you wish to go that far. There you go. I could go into a lot more detail about the swords but there are many people who know much more about armour, shields, and clothing than I. Well first you need to decide more specifically 12th or 13th, and narrow it down even more from there. There is alot of change in the 12th and 13th. Are you wanting to do a 3rd Crusade (late 12th)? Sorry, didn't know there was a lot of change between the two centuries. I'd have to say then that I'd go with the 12th century. What would be the difference between the 2nd and 3rd crusades? Thank you J.D. Crawford for all the information! Really I was saying you needed to pin it down, because there would be a big difference in kit between say a 2nd Crusade kit and a Siege of Acre late 13th C kit. *I gotta qualify this. By 1190 surcoats do seem to be in use in some areas, but not in others. Earliest surcoats I am aware of in art is in the 1190-1200 timeframe, and they still seem to be in the minority. Cross the 1200 line and they become commonplace pretty quickly it seems. Thanks for the info! It's really helpful. Kingdom of Heaven's Hospitallers have over-large and wrongly shaped crosses. The black cappa clausa might have a white cross (in the 13th century closer to a cross formee than the later 8-point variety) of perhaps 4" size. It is not certain that the cross was even worn prior to the early 13th century, so it might not be proper for the 2nd Crusade/ c.1150, though more likely for the 3rd Crusade. No surcoats were used in the 12th century. Although there are many sources showing a black shield, the limited evidence shows the shield should match the arms on the banner--white cross on red--rather than the color of the monastic robe. There are some minor differences between 2nd Crusade mid 12th century, and 3rd Crusade end of the 12th century. For example, 2nd Crusade is less likely to have mail chausses, while 3rd Crusade helmets tend to be more hemisperical than conical. Enclosed helmets should be avoided, though the 3rd Crusade begins to see some enlarged nasals or facemasks, especially in Spanish and Italian monuments. Here are two links to manuscriptminiatures.com sorted to 1130-1150 and 1180-1200, as well as links from a thread on armourarchive.com for early 13th century Hospitallers..
Was there any other armour used at the time? What armour would have been worn for the "average" soldier then? Maille was expensive, right? Did they wear leather armour or cloth? You have to decide if you are Hospitaller Knight or their "auxiliary" troops, turcopoles and footsoldiers who are not sworn brothers. If you are a Knight, you would be issued all equipment a knight need, all the available armor, horses, sword etc... At least I think a sworn brother didn't have to buy his own arms and armor. Although he could bring his old equipment with him when joining the Order. It seems likely that the sleeved cappa clausa was worn over the mail, as the switch to black surcoats granted in 1248 was granted due to the monastic robe inhibiting the arms during combat. The only mail that would be seen was the hood and forearms of the hauberk, and the shins of the chausses. As I noted, mail chausses were not likely worn during the 2nd Crusade, but seem common by the 3rd, at least the style of chausses which are laced up the back. Mail mittens don't appear on hauberk sleeves in mid-century illuminations (2nd Crusade), but are somtimes in use by the 3rd Crusade. Mail was expensive but was worn by knights--brothers. 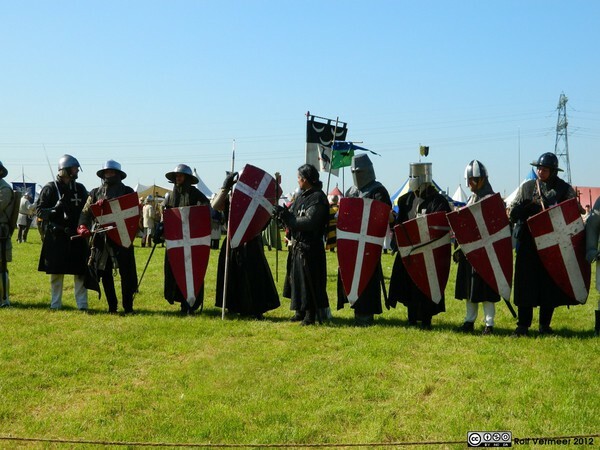 Sergeants likely wear cloth aketons or gambesons by the 3rd Crusade, or perhaps mail byrnies, a shorter variant of the mail hauberk with half-sleeves, no hood, and no thigh protection. Turcopoles might wear short mail shirts, padded armors, or khazagand of Islamic origin. If you want to portray a knight of the order during the Third Crusade, you should have a mail hauberk with hood and long sleeves. You might have no mufflers (mail mittens), or one on the right hand only, or both hands might be covered. You would likely wear mail chausses laced up the back. You would probably wear a cotton aketon beneath the mail, and a black wool cappa clausa over the mail. You would have a domed helmet, probably with a one-piece skull and attached brow band and nasal. You would carry a flat-topped kite shield, probably bearing the arms of the order (white cross on red). Your arms would likely be a lance and sword, and possibly an ax or mace as a backup. An "average" soldier? Someone not of the knightly class would not be as well armed, and would not wear the cappa clausa. At best, we might see a hip-length, half-sleeved mail byrnie worn with a conical helm or kettle hat. Spear and shield would likely be the most common armament. There's nothing to distinguish you as being part of the Hospitallers other than the shield during the 12th century. Thanks to all who took the time to give information and correction to my questions. As a fellow Hospitaller, I commend you! I'm in the same dilemma, so if anyone has any suggestions re:garb, kit, or most importantly, swords, let me know. I'm also working under a budget (stupid DC high cost of living), so cheap isn't a bad thing. That said, if you've got the cash, Medieval Design, an Italian company, does an excellent Hospitaller kit, complete with period-accurate cappa, undertunics, coif, and braies and chausses. I'm hoping I can afford it at some point. It can be found here: http://www.medievaldesign.com/eng-prodotti-uo..._chiave=27 at the bottom of the page. 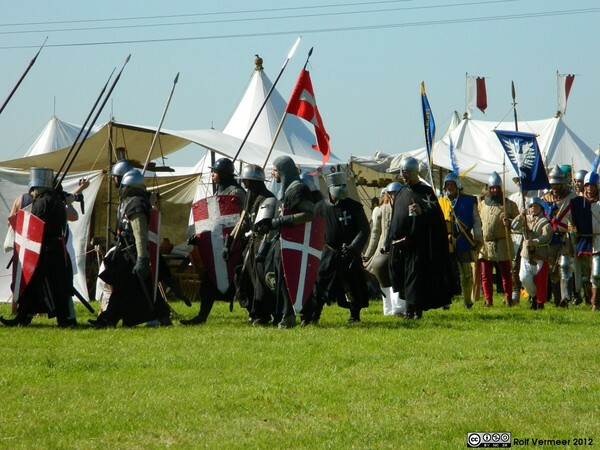 It seems likely that the sleeved cappa clausa was worn over the mail, as the switch to black surcoats granted in 1248 was granted due to the monastic robe inhibiting the arms during combat. I think that depends on your interpretation. The original documents do not refer specifically to the sleeved cappa clausa, but to the more generic term "uniform". But we don't know for sure what was meant by that. Many researchers believe that this is the sleeved cappa clausa but this is not certain. There is also research and interpretations that the mantle and not the cappa clausa is the uniform of the Knights Hospitallers. That is the interpretation that our reenactment group uses. Under this interpretation a Hospitaller wears his uniform (mantle) over whatever normal garb he is wearing. Most Hopitallers are brothers so their normal garb is a sleeved cappa clausa (note: no cross on this. The cross is on the uniform and here the uniform is only the mantle). Sergeants would wear the mantle over their regular medieval clothing (tunic + hosen). In battle you would wear the mantle over your armour (so: gambeson + optional maille + mantle). This also fits well with the original papal order since a mantle would be pretty inhibiting in a fight. Female Hospitallers are usually either nuns or donati so, hey would wear a mantle over their habit (nuns) or their regular dress (donati). Note that for donati the uniform has a T-shaped three-legged cross. The top leg is missing and would only be granted to them when they became nuns. There are other parts of the Hospitaller look that are open to interpretation as well. For example, the colour of their shield. Most often early Hospitallers are depicted with black shields with a white cross, matching their uniform. But our Hospitaller group disagrees. We use red shields. The problem is two-fold. First, there are no depictions of early Hospitaller knights. There are only depictions of Hospitaller knights from after 1278 when they all wore red in battle. Second, we know from various scrolls of arms that the flag of the order was red with a white cross, even before 1248. Our group did some research and we found images from Templars from before and around 1250. The interesting thing is that Templars have the same problem as Hospitallers: The uniform differs from the flag. A Templar uniform is wite with a red cross, but the Templar flag is white with the top third black. We found images of Templars with shields that show the Templars used the design of the flag and not the design of the uniform on their shields. So, we assume that the Hospitallers did the same. Hence red shields and not black shields. I discussed the shield issue and our research/reasoning with a few researchers and even they don't agree. David Nicolle (from the Osprey books) isn't convinced and sticks with black. Helen Nicholson (author, expert of the crusades and the Hospitallers in particular) thinks our reasoning is sound and agrees with red. Take your pick. Thanks for the input, but after viewing the photos, I'm left wondering what the cut of the "mantle" is, and how it varies from the surcoat which replaced it? As another argument in favor of the arms--white cross on red field--matching on shield and banner, it is worth noting that heraldic surcoats are rare in the 12th and early 13th centuries, with the fabric rarely representing the arms born on the shield. My apologies. 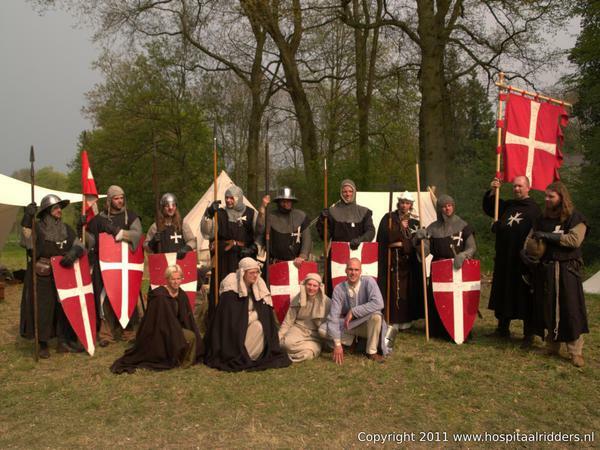 I should have mentioned that our group does Hospitaller reenactment from 1248 to 1259. That's the period when black surcoats are allowed. When we go to battle we wear surcoats, but for the rest we wear mantles instead of surcoats (i.e. the mantle goes directly over the maille, no surcoat). For example, when standing guard at our camp site. According to the papal order, surcoats were only permitted when faced with a direct threat (e.g. battle). One possible depiction of a Hospitaller appears in a French Bible Moralisee dated to 1226-1250, now in the Austrian National Library: ONB Han. Cod. 2554, fo.4r, roundel 4. I have this "poncho" image saved, but it's 1.7MB, too large to post. I have a doubt about the shape and the location of the cross. Sometimes, I see picutres where the cross is located at the center of the tunic, while in others, the cross is located at chest, close do the heart. Which one is right and what about its size?